Quorum Quenching (QQ) has been developed over the last few years to overcome practical issues related to membrane biofouling, which is currently the major difficulty thwarting the extensive development of membrane bioreactors (MBRs). QQ is the disruption of Quorum Sensing (QS), cell-to-cell communication enabling the bacteria to harmonize their behavior. The production of biofilm, which is recognized as a major part of the biocake formed on a membrane surface, and which leads to biofouling, has been found to be one of the bacterial behaviors controlled by QS. Since the enzymatic disruption of QS was reported to be efficient as a membrane biofouling mitigation technique in MBRs, the application of QQ to lab-scale MBRs has been the subject of much research using different approaches under different operating conditions. 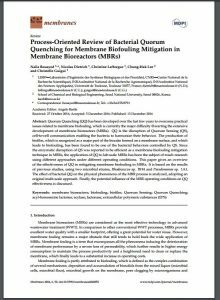 This paper gives an overview of the effectiveness of QQ in mitigating membrane biofouling in MBRs. It is based on the results of previous studies, using two microbial strains, Rhodococcus sp. BH4 and Pseudomonas sp. 1A1. 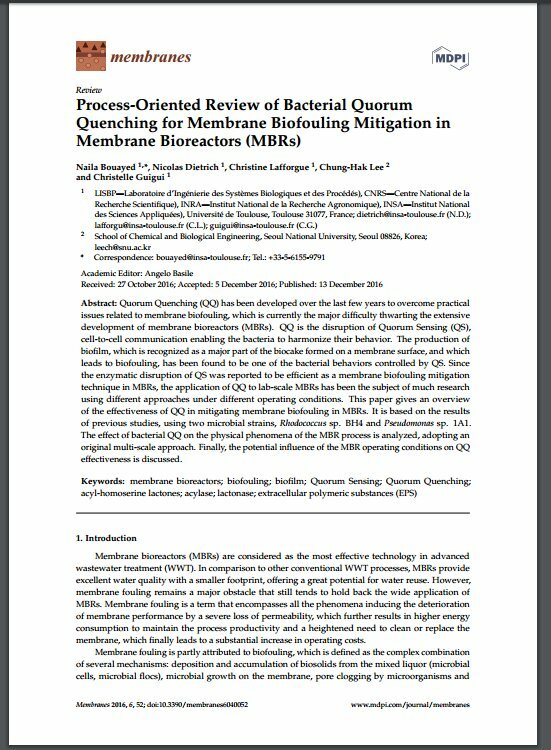 The effect of bacterial QQ on the physical phenomena of the MBR process is analyzed, adopting an original multi-scale approach. Finally, the potential influence of the MBR operating conditions on QQ effectiveness is discussed.